The internet makes it very easy to convert DVD to MP3 as it is brimming with free DVD to MP3 converters. However, it may turn out to be like this: the conversion seemed to process and end fine, and I copied it from my PC to USB. But the the MP3 audio file doesn't play well...lots of static, sticatto kind of sounds and nothing recognizable; or like this: the issue with DVD to MP3 ripper that I'm having is that the program starts the extraction/conversion for the Title and Chapter I've selected, but it doesn't seem to know when to stop, or some other problems. Here we test and select top 5 DVD to MP3 audio converter software for better DVD to MP3 audio ripping. "Better" means fast speed, high output MP3 audio file and smooth progress. 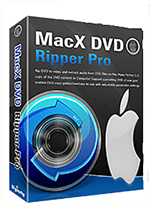 And we share the specific user guide for beginners to extract MP3 from DVD with the best DVD ripper for Mac/PC. * 1:1 Rip MP3 audio music from DVD movies with 5x faster speed than other free DVD to MP3 converters. * Decrypt and convert DVD to MP3, be it DVDs encrypted by Disney DRM, CSS, Region Code, RCE, Sony ArccOS, etc. * Directly extract DVD MP3 audio to iTunes, iPod Touch, iPhone Xs Max/Xs/XR, Galaxy S9, iPad Pro/Mini 4 etc. * Convert DVD to other lossless audio formats, AAC, AC3 and more. * Adjust audio parameters, like bit rate, audio sample rate, audio channel, etc. * Fully compatible with Win 10 and macOS Mojave 10.14. 1. 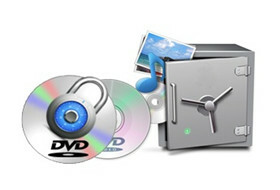 Free download the DVD to MP3 audio converter for Mac or for Windows and run it. Click "DVD Disc" to load the DVD movie. 2. From the Popping-up Output Profile window, head to "to Music" > "to MP3" to free rip DVD to MP3 music on Mac/Windows. 3: Click "Browse" the next step to change the default folder to a new one. 4. Hit "RUN" button to start DVD movie to MP3 audio music soundtrack conversion process. Tips: the "Safe Mode" works great in smoothly converting newly released DVDs. The all-around DVD to MP3 extractor also convert DVD to MP4, DVD to MOV, AVI, MKV, MOV, WMV, AAC, AC3, OGG, any audio video formats. VLC Media Player is one of the most commonly used video movie players, and also an amateur DVD to MP3 converter freeware for Mac/Windows/Linux we can download to extract MP3 audio from DVD. If you have VLC installed before and your DVD discs are not encrypted, try VLC. Tips: But VLC is not specially designed as a DVD to MP3 ripper comparing with other free DVD ripper Mac on the list, sometimes it gives disappointing results reported by users on VideoLAN Forums, for example, the free DVD to MP3 audio extractor crashes when ripping longer DVDs, convert/save not working, VLC fails to read DVD disc, wrong chapters are chosen to convert, etc. 1. Insert unprotected DVD to your computer's drive. Run VLC. 2. Head to Media > Open Disc(or Ctl-D) > Open Media > Disc > Disc device, and select the DVD disc to load. 3. Click on the Convert/Save to open DVD to MP3 ripping window. 4. 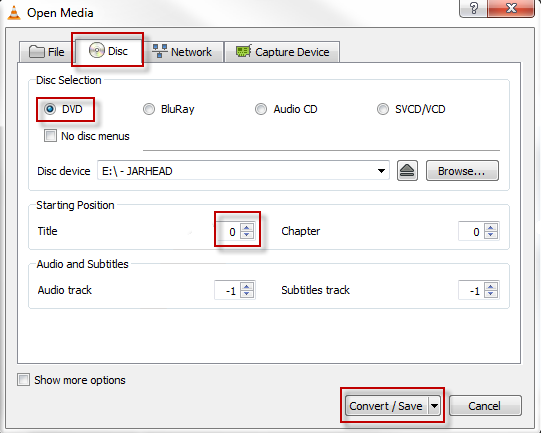 Select output folder to save extracted MP3 audio from DVD disc file. 5. Select "MP3" as output audio format. 6. Click "Start" button to start convert DVD to MP3 with the DVD to MP3 free converter software. This free DVD music ripper has good UI design, giving an easy way to extract MP3 music audio from DVD for playback on MP3 player iPhone iPad Adroid. It also allows to choose audio tracks and adjust audio settings. Output MP3 audio file quality is OK. 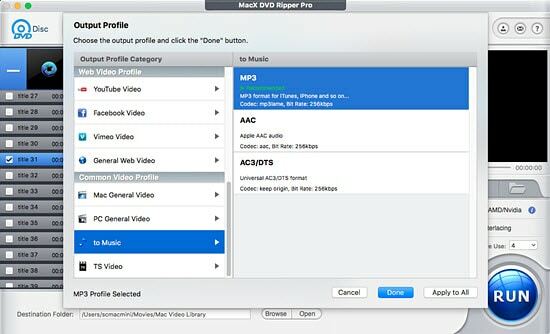 Tips: The free DVD to MP3 audio music ripper is not compatible with Windows 10 and Mac. Encrypted DVDs to MP3 conversion is not said to be supported on its official site, so users have to turn to other DVD decrypter for Mac/PC to rip protected DVDs to MP3 audio format. Do not go to other third-party software site to download the program, which is tested to download other annoying adware, malware, fail to install this free DVD to MP3 converter. 1. Download and run the DVD to MP3 audio music converter. Load the DVD you want to convert by clicking "Load DVD" button on the main interface, or "Load DVD Folder". 2. After the DVD is fully loaded, you can choose Title to convert. The DVD to MP3 ripper lacks ability to choose the right title automatically, but we can define the right full title by movie video length. 3. Below the Title category, we can see "Copy as", from which we are allowed to choose "MP3" as output with normal quality. 4. Click "Browse…" to select a folder to save MP3 audio music file. 5. Click "Start" icon to start extracting MP3 music audio from DVD with high quality. It is a professional DVD to MP3 audio extractor for free. It converts DVD movie video to MP3 audio music with fast speed and good audio quality above the average. Audio settings feature lets you adjust audio bit rate, sample rate, encoder, etc. Note: The DVD to MP3 ripper freeware shows ads, promoting its paid advanced version. It may fail to convert newly released DVDs movies to MP3. You are only allowed to rip DVD to MP3 in a length of 5 minutes, and for less than 5 minutes file, you could only get half of it ripped. 1. Free download the DVD to MP3 audio converter full version and run it. Click "Add DVD Disc" icon to load Disc, or DVD Video TS Folder. 2. After the DVD is loaded, check the box to select video Title to rip MP3 audio music. 3. Click "Profile" button and head to General Audio, choose MP3 as output. 4. Click "Browse" to choose a folder to store audio music file. 5. Click "Convert" button to begin converting MP3 audio music from DVD movie video. The DVD to MP3 music ripper for Windows/Mac can extract MP3 audio music from DVD disc, easily for later playback on iPod, iPhone, PSP, etc. with OK audio quality. 5.1 Dolby surround sound is supported by the DVD MP3 audio ripper. Basic audio editing function, say, merge join small MP3 audio file, select audio track, set start time and end time. The DVD to MP3 conversion software full version can't be downloaded on Windows 10 or Mac El Capitan/macOS Sierra. Output profiles for mobile devices are out of date. New DVD movies from Disney and other encrypted DVDs are not supported according to the DVD to MP3 music converter official site. 1. Free download the DVD to MP3 audio converter full version and run it. 2. Click "DVD Disc" icon to load DVD. The DVD to MP3 audio ripper accepts DVD disc, DVD folder and DVD IFO files. 3. Choose DVD video movie title to convert. 4. Click "Profile" bar and choose MP3 audio as output. 5. Hit "Convert" button to convert the DVD video movie to MP3 audio. It fully supports to convert encrypted and non-protected DVD movies to sound tracks in MP3 as well as AAC, OGG, WMA etc. key audio formats with high MP3 audio music quality reserved. 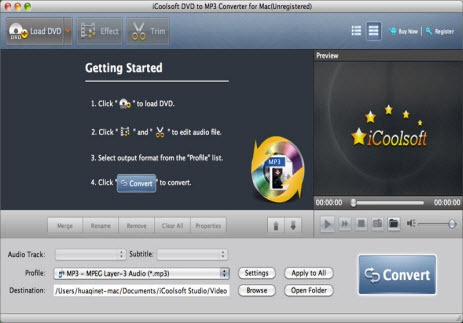 The DVD to MP3 audio converter supports both DVD disc and DVD folders. Virus-free, no adware. The DVD movie to MP3 converter lacks update, best Disney movies DVDs and other lately released DVDs are not supported. Windows 10 and Mac users are recommended to switch to the first top DVD to MP3 ripper on the list, as this DVD to MP3 extracting software is only compatible with Win 7 and below. 1. Free download the DVD to MP3 music converter full version via its official site, and run it. 2. Load DVD disc by clicking "Browse" on the Input Movie area, it may take some time. 3. On the top of the window, select "To MP3". 4. You can hit "Edit" button to adjust MP3 audio parameters. 5. Hit "Convert" button to start the DVD to MP3 audio extractor. No matter which free DVD to mp3 converter you will take, you can finally rip DVDs to MP3 for free. Then what? To enjoy your DVD audio on mobile devices, an iPhone transfer software will be common used. That's MacX MediaTrans, which is talented on transferring music from Mac to iPhone iPad, in spite of the MP3 files, or AAC, FLAC, AC3 etc. Still, you can even manange the scrambled music such as editing songs' details, deleting music in batch, creating playlists, making ringtones etc.